~ 500 lb Capacity~ Button-back styling~ 2 position recline ONLY~ Low-volt motor~ Chaise pad available~ Heat & vibe oprions available~ Fabric upgrade availableThe 3555 is our bariatric model, with a weight capacity of 500 lbs. This model has a extra heavy duty frame, heavy duty springs in the seat and back, and extra foam in the seat and arms. 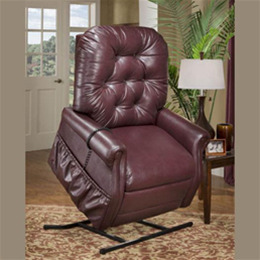 Super heavy duty reclining hardware is standard on this model.The 3555 also come standard with a heavy duty, low voltage motor.